In the 1920s and ’30s, art by Pueblo artists was avidly purchased and displayed by collectors across the United States, which allowed many of these artisans to make a decent living through native craft. 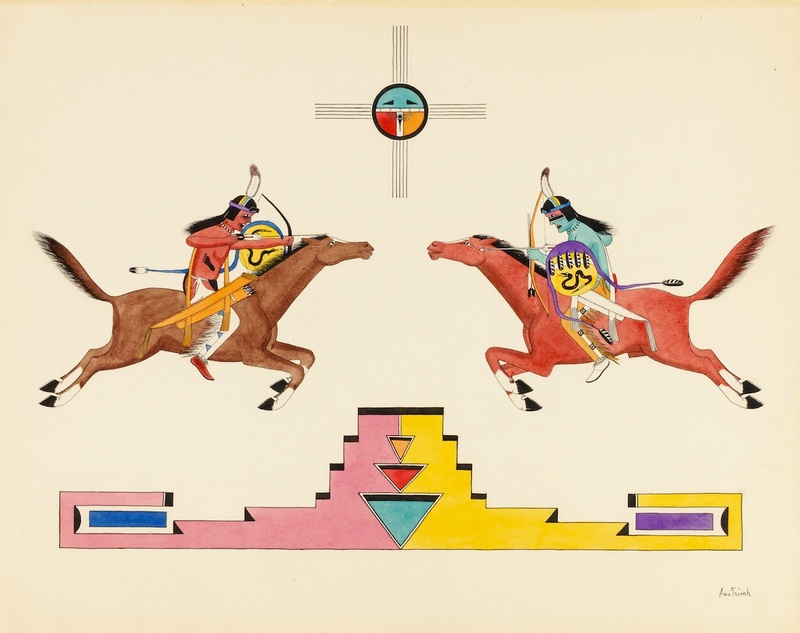 One of the first Pueblo painters to build a successful national reputation was Awa Tsireh (also known by his Spanish name, Alfonso Roybal), who developed a unique style of watercolor painting that blended Native and Anglo influences in works capturing the social lives and cultural practices of indigenous communities. 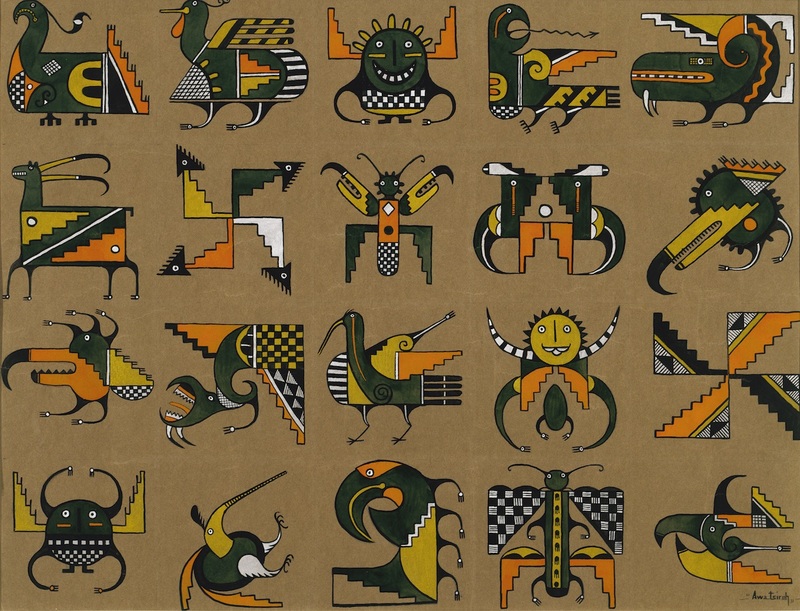 Fifty-one of his modernist-inspired works are now on display at the Smithsonian American Art Museum (SAAM) in The Modern Pueblo Painting of Awa Tsireh, a three-room exhibition that not only highlights an art tradition from a distinct culture but also shows the stylistic development of one of its key artists. 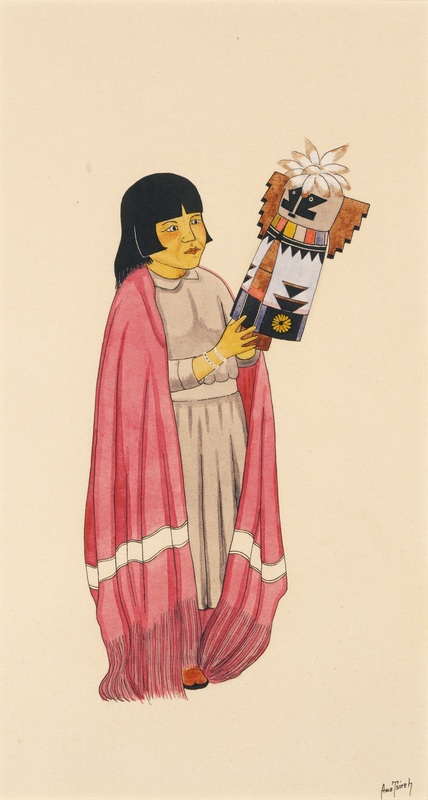 The National Museum of the American Indian (NMAI) may seem a more obvious host for such an exhibition, but the entire collection was gifted to SAAM in 1979, before NMAI was established, by the daughter of Tsireh’s patrons, American artist William Penhallow Henderson and poet Alice Corbin Henderson. Their display in SAAM is also significant as it places Tsireh’s paintings within a broader historic context and highlights his outside influences. 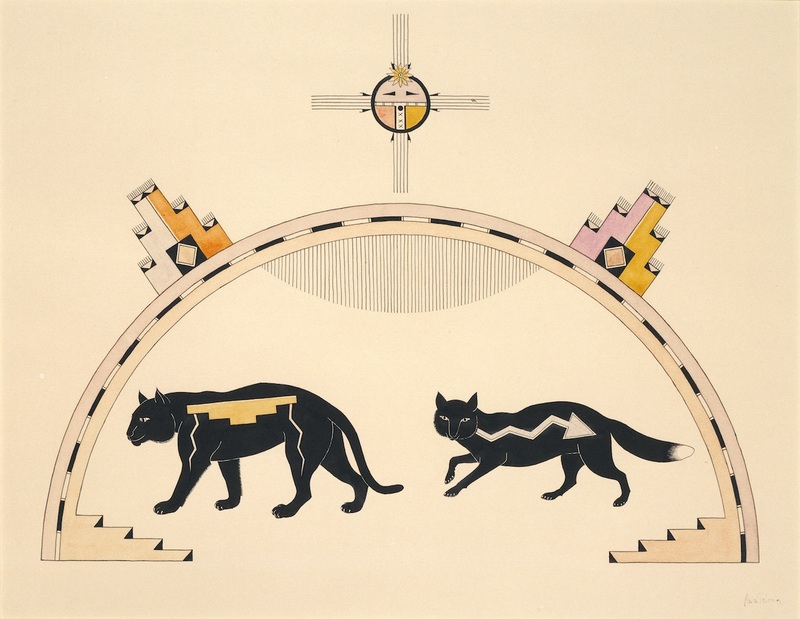 According to Moser, Tsireh was a pioneer of the modern Pueblo watercolor art movement along with Hopi painter Fred Kabotie, inspiring other Native American artists to experiment with the medium while incorporating the forms and skills of pottery craft. Tsireh himself began as a potter while growing up in his San Ildefonso Pueblo, located near Sante Fe. 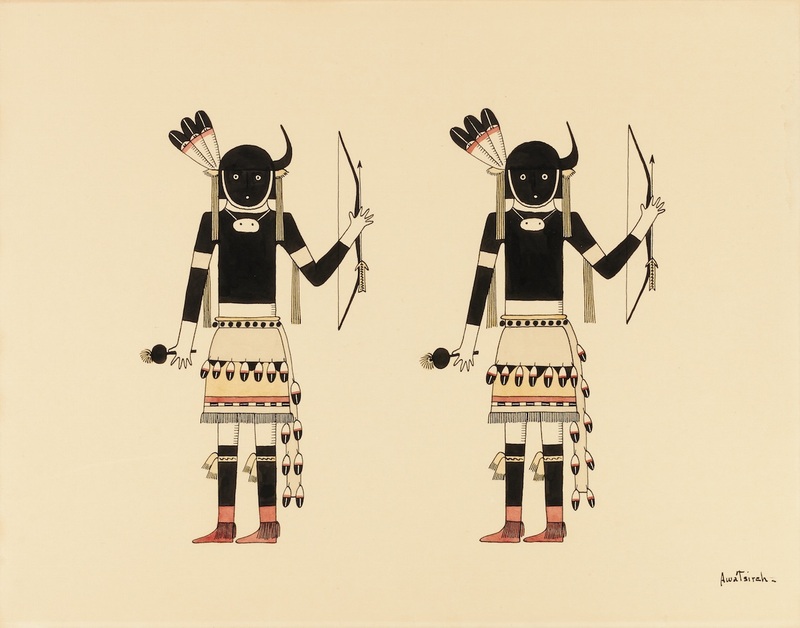 Tsireh focused largely on painting the many rituals of not only his tribe but also those performed by others outside his immediate community, from the Hopi in Arizona to the Navajo to tribes in Mexico — a rare, all-embracing approach that illustrates an anthropologic curiosity. Many of his figures are shown in one line to convey dances performed in unison; there’s a formality and sense of control in these works, but they are eye-catching and vividly colored due to Tsireh’s heavy attention to detailing the specific costumes of each ritual. While dancers are identical in form, which emphasizes the repetition of performance, they often wear a variety of outfits and headgear. Tsireh recorded kilts printed with symbols, feathered headdresses, fringed clothing, white moccasins, and a wide variety of masks, often horn-tipped. 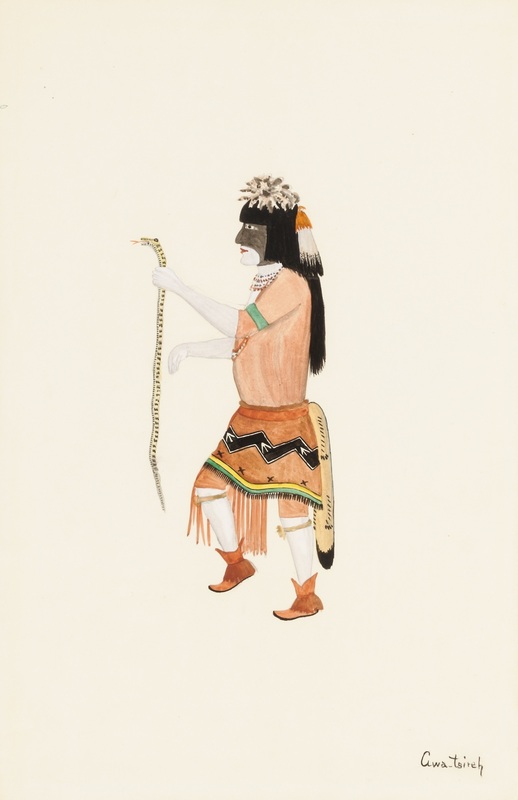 The people he painted also hold ceremonial objects, from weapons to evergreens, gourd rattles to live snakes. Animals also caught his attention: His series of “Rainbow Paintings” showcases elk, mountain lions, sparring antelopes, and more creatures under incredibly geometric rainbows and suns, with the natural elements representing regional symbols. Seen together, his works reveal a clear evolution of style, especially since he painted the same themes throughout his career. 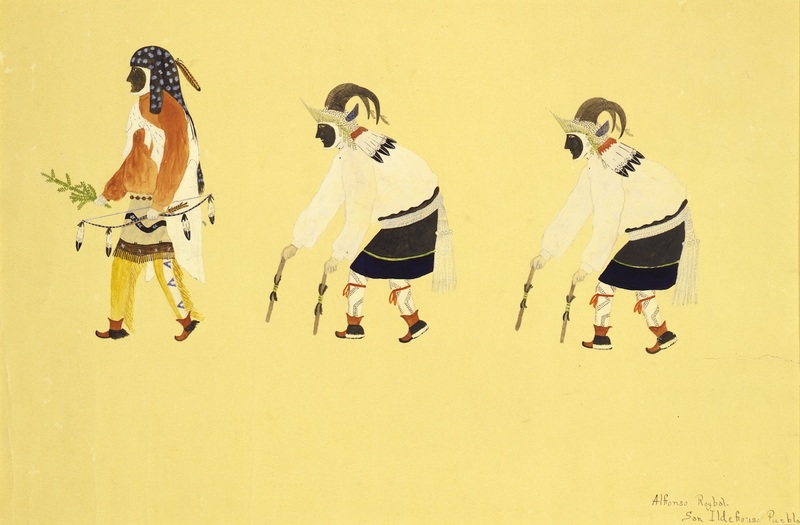 One of his early works, “January 23rd, Buffalo Deer Dance” (1918), shows six figures in a natural setting, roaming between and descending hills. The scene of depth is rare for Tsireh, with most of his works rendered mostly on plain backgrounds, but he continued painting naturalistic figures in profile for a number of years. This approach increasingly gave way, in the 1920s, to more stylized and abstract renderings that illustrate a flattening of subjects as well as an increased linearity. 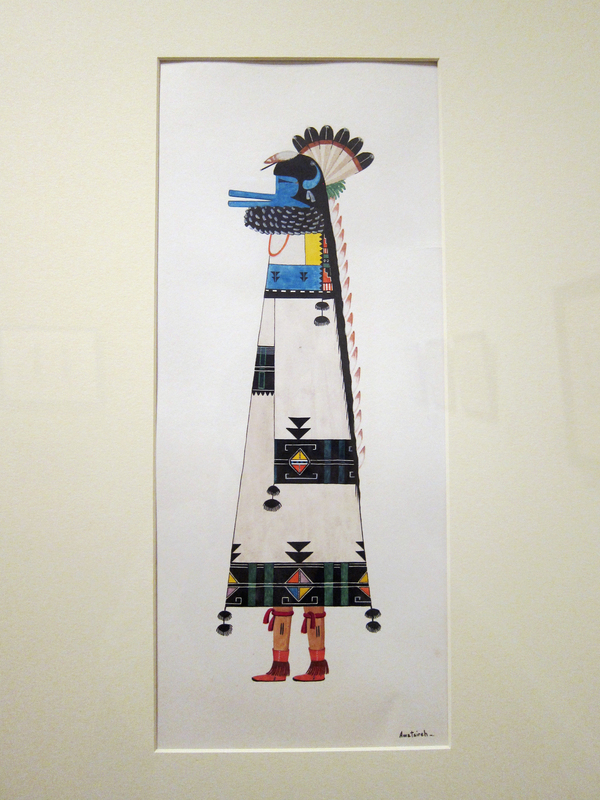 William Henderson had encouraged Tsireh to browse his collection of art books, and the artist consequently incorporated myriad outside elements into his works: one can find echoes of bold Art Deco geometries — especially evident in the “Rainbow Paintings” — hints of Japanese woodblock prints, and even signs of Egyptian art, such as side-turned feet attached to frontal-facing bodies. Still, Tsireh’s work is distinctively his own, and American collectors were drawn to this unusual amalgamation of styles coupled with what Moser described as an “exoticism of this Native population’s expression.” The reason he produced so many works may, for the most part, be attributed to outsider demand for his paintings. 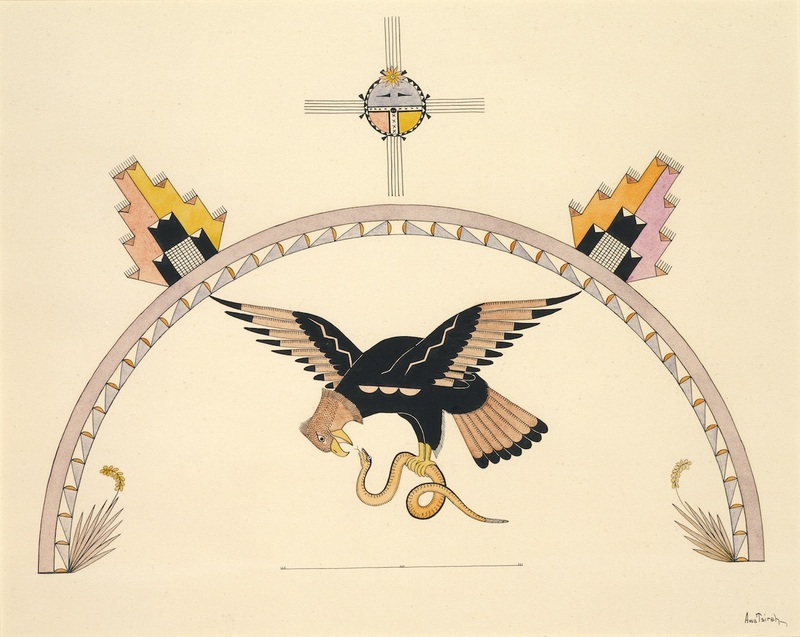 In the 1920s, the School of American Research, then part of the Museum of New Mexico, gave him a sponsorship to paint full-time; he also received studio space in the museum, as did Kabotie and Velino Shije Herrera, from the Zia Pueblo. In the mid-1930s, however, many of the works became tokens for tourists, and artists began producing repetitious forms that did not demonstrate much innovation, as Moser explained. 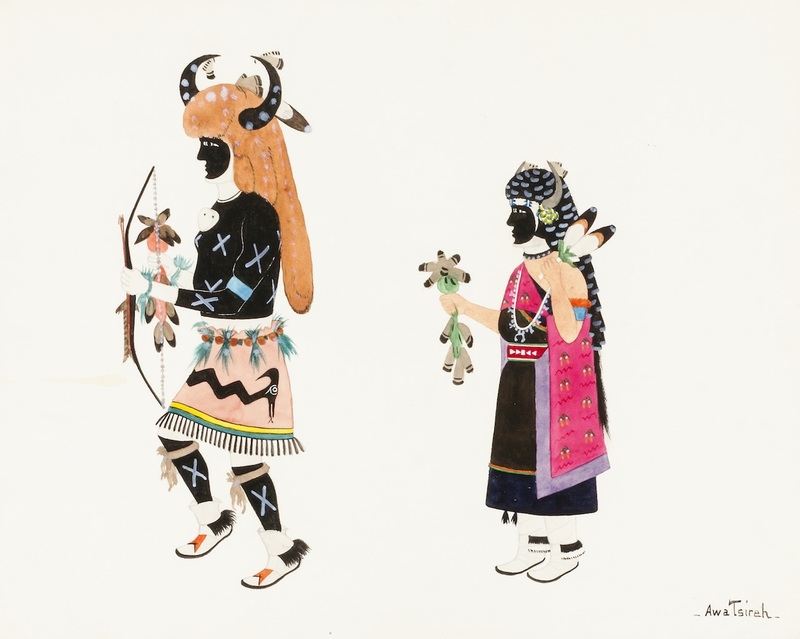 Tsireh’s watercolors recall a remarkable period of creative art-making from the Native American community, and this exhibition gives him dimension and the recognition he deserves. 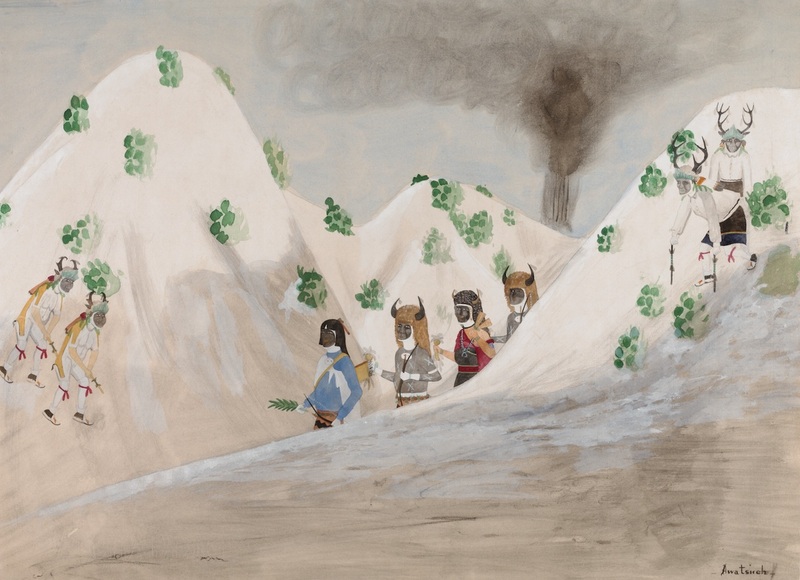 The Modern Pueblo Painting of Awa Tsireh continues at Smithsonian American Art Museum (8th and F Streets, NW, Washington, DC) through January 31.